As soon as 14Forward opened its doors, it caught the attention of local government officials throughout California and beyond. Bendorf estimates there have been nearly 40 visits to the site, and other communities are beginning to emulate the program. It took homeless individuals some time to see the value of 14Forward. Perception initially was negative among the homeless community. “I would walk the levee and say, ‘You will never catch me there’, “ says Rosa Muniz, who was homeless before agreeing to come to 14Forward. Now she lives in a three-bedroom, two-bath mobile home with her husband, son and mother. The building of strong relationships between 14Forward staff and residents is proven to be paramount. And that, too, takes patience. 14Forward’s success has become a rallying point in the community to help the homeless. The message that “if we all work together we will achieve better outcomes” has resonated with all sectors of the community, Bendorf adds. 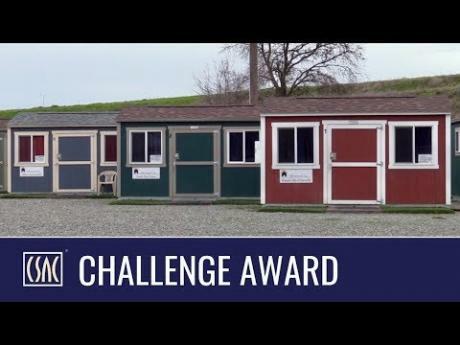 This Yuba County program is a recipient of a 2018 CSAC Challenge Award, which spotlights the most innovative programs in county government. The program was only one of two to receive the California Counties Innovation Award.